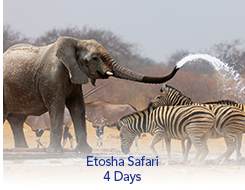 Etosha, “The Great White Place,” is one of Southern Africa's finest game reserves. It is home to 114 mammal species, 340 bird species, 110 reptile species, 16 amphibian species and one species of fish. The reserve was created around a mineral pan believed to be over one billion years old. 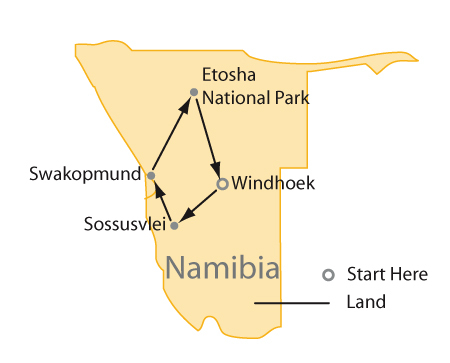 We travel north to Namibia's prime wildlife sanctuary, the Etosha National Park. Spend the afternoon at leisure and take in the savannah environment, relax on the private veranda of your chalet or cool off in the sparkling pool. Spend two days with morning and afternoon game drives devoted purely to the abundant wildlife found in the Etosha National Park, which surrounds a parched salt desert known as the Etosha Pan. The park is home to 4 of the Big Five - elephant, lion, leopard and rhino. Waterholes support a rich diversity of birds and mammals, including rare species such as black-faced Impala, roan, cheetah and Namibia's smallest antelope, the Damara Dik-Dik.